The model presented in ”The Limits to Growth”. Back in 1972 the now classic book ”The Limits to Growth” was released. 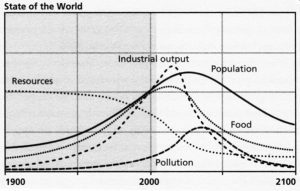 It presented a model based on five variables: world population, industrialisation, pollution, food production and resources depletion. These variables are considered to grow exponentially, while the ability of technology to increase resources availability was considered to grow linear. Based on this and how we deal with it the book also presented three scenarios, two of them predicted ”overshoot and collapse” of the global system by the mid to latter part of the 21st century, while a third scenario ended up in a ”stabilized world”. So, we’ll pick the later one right? Initially the book went head on with capitalistic economist, since we live in a world based on consumption. However, today, buying green and making other choices in your purchases have proved that sustainablility and consumption not necessarily are opposites. Reduce eating meat, eating out, buying snacks and buy locally produced. You don’t have to become a vegan (unless you want to), but making you own food, skipping meat at least one day per week and how about making you own snacks? Buy organic, long lasting, vintage. Skip things you really don’t need. These days stores that rent out clothes are opening up too, a good option to buying a fancy dress for a big event that you will only use once. Buy used or new products with high efficiency compared to the energy they use. Avoid products with toxins in them. Buy eco-friendly or make your own cleaning products, then you’ll know what’s in them. Invest in used furniture, textiles you can wash instead of paper and skip make-up, you’re pretty just the way you are. I’ve written earlier about green gifts here. It has never been so easy to rent stuff as it is now. Or well, it has. Back in the day sharing was they way and we’re slowly getting back into it. It’s a good option and there are apps available where people rent out equipment you don’t really need to own yourself. Like drills. Going digital is also a way. Digital subscriptions to newspapers are usually available. Lastly I’ll share a documentary. It’s kind of a ”Limits to growth” revisited. I should add that it was made before the Paris agreement, which is an important step towards a hopefully ”stabilized world”.